Stuck in Dublin in wintertime? It takes only a short bus ride to reach one of the country’s most scenic areas for day tour of nearby Glendalough. On a recent weekend, I climb aboard a bus to make my brief escape from the city. As the bus picks up pace, the perpetual lines of traffic covering Dublin are left in the dust. The hour and a half trip down is quite scenic. As we round the gap of Wicklow, it ‘s clear why so many movie makers choose this area to film their stories in. Braveheart, Reign of Fire, Michael Collins and many others feature this beautiful area. The landscape shifts constantly from areas of bare granite to lush countryside, and then to thickly forested mountain sides. It’s a high level of ecological diversity, packed into a small area. Wicklow is, in fact, the most mountainous county in Ireland. It’s wildness may be the reason why it was the last county to be renamed by English colonists. Hopping off the bus in Glendalough, the first thing that strikes me is the clearness of the air. Ah, oxygen as it was intended to be! I vow immediately to get out of Dublin more often. After a brief stint in the Visitor Center and a short audio-visual show, we’re on our way. Our tour guide is friendly and informed, and as we’re in the off-peak season, has plenty of time to answer questions. A short walk leads us to the monastary in the city center. This settlement was founded by St. Kevin sometime in the 6th century, and has been a magnet for pilgrims and visitors ever since. The monastery and its environs flourished and expanded until the 16th century, when much of it was destroyed. Though present remains tell only some of the story, the settlement is still impressive. A small footbridge brings us into the old city, where we find ancient churches, a cathedral and a graveyard full of decorated crosses. We’re invited to hug a large free-standing Celtic cross. Apparently, if your fingertips on both hands can touch, you will have good luck. Given the shroud of mist threatening to engulf us, I decide my luck might be better served not hugging a soggy, old cross! Then, there it is. 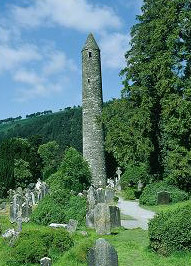 The famous Glendalough Round Tower. Its remarkable to look at, and still in perfect condition despite being almost 1,000 years old. The image of this stone tower rising 34m high against a backdrop of rolling hills and lush valleys is still one of my favorite pictures of Ireland. Budding photographers will kick themselves if they miss the opportunity to capture this sight. We move on to the “valley of the two lakes" (Glen da loch). We are entering what was once a glaciated valley and still contains hanging lakes on its mountainsides. The whole surrounding area is imbued with a misty serenity. It makes sense that St. Kevin, who denied the decadent ways of modern living, would choose this spot for his hermitage. The tour visits St. Kevin’s Bed, a cave where he lived overlooking the Upper Lake. It’s now lunchtime, and we stop off in the Glendalough Hotel for a bite to eat. The hotel is pleasant enough, serving a standard carvery lunch. But you might want to wait for lunch in Avoca – the next stop just half an hour away. Avoca handweavers has a legendary restaurant with an inspiring selection of delectable dishes. Particularly recommended are the vast array soups and salads, all healthy and substantial enough to ward off any lingering winter bugs. I opted for a pumpkin soup followed by salmon pie, and was not disappointed. If you like what you get, you can pick up one of the Avoca cookbooks in the shop, along with any number of hand-woven clothes and other luxury goods. These items won’t come cheap, but they are original and of a very high quality. Avoca is a quiet little town, now famous in Ireland for being home of the nauseating clerical television drama Ballykissangel. On the mainstreet can be seen a pub called Fitzgerald’s, an Irish Gift Shop, The Bridge Restaurant, The Church and the Post Office. That’s about all there is really! (for a prelimary tour on the internet, visit www.avoca.com). Fitzgerald’s pub is a lovely, welcoming place and in the tradition of Irish pubs, boasts it serves the best Guinness in the isle. I don’t know if it was the best pint I ever had, but it was pretty good. It seemed unfortunate, at this point, that I could not stay on – it was time for our little tour to head back to Dublin. All in all, this short tour provides a great taste of a beautiful area. It’s a great trip to make in winter, when there are few tourists and you’ve been stuck inside for too long. Meals and refreshments are not included in the tour price, and you’re advised to wear comfortable footwear and raingear as there will be some walking involved. TOURS: There are plenty of good tours running to Wicklow all year round at fairly reasonable rates ($30 - $40 USD) for day trips, which will save you the hassle of rent-a-car. Most tours cover the same ground, but Irish City Tours (www.irishcitytours.com 011 353 1 458 0054) and Day Tours Unplugged (www.daytoursunplugged.ie 011 353 1 8340941) are recommended.